If design is the torch that illuminates advertising’s path forward, South Florida based agency Brand Tango is its torchbearer. It is a rare agency that leads fearlessly into the future of advertising design. While lightening fast change continues to shake up the industry it is the extraordinary creativity of top agencies like Brand Tango that make it a breathtaking ride. On March 12th, the Deerfield Beach based marketing, design and technology company cemented their #1 position by dramatically sweeping the American Advertising Federation of Greater Fort Lauderdale Addy™ Awards. Eleven of their clients, from seven different industries, shared their joy in topping one hundred and eight other agencies by taking home ten out of twenty-three Professional Gold Awards, nineteen out of ninety-nine Professional Silver Awards and an astonishing four out of nine Judges Awards. Including the top prize Best in Show for Unity Recovery Group’s Rebranding Concept Book, which also scored the Best in Self-Promo Judges’ Award. Other Judges’ Awards were Best in Print for Unlimited Vacation Club by AMResorts Member Kit (Spanish) and Judges’ Choice for Silverleaf Vacation Store - Heartbeats Reception Video (60 second). “We never dreamed that all twenty-nine of our entries would win awards. Our client partners and the Brand Tango Team are delighted to be honored with an astonishing thirty-three Addy Awards,” states CEO Joe Russoniello. “To have it coincide with our tenth anniversary is icing on the cake,” he added. All twenty-nine of Brand Tango’s entries, which cross nearly every category in the American Advertising Federation program, are automatically forwarded into the District Awards, whose winners then move-on to the National Awards. If winning an Addy Award puts an agency on the map, then sweeping the awards most certainly crowns one. 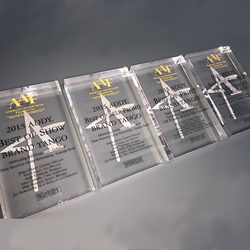 “The award-winning creative truly reflects our diverse client roster. We share these awards with our inspiring clients, for whom these opportunities wouldn't be possible” states recently promoted agency President and Chief Creative Officer, James Kluetz. “We have had a wonderful first decade in business. The next ten years will be defined by our expanding ideation to incorporate even more emerging technologies – this is an exciting time for brands and the growing number of ways they can engage their audience,” he adds. Awards were also shared with hospitality clients Blue Strawberry, Capital Resorts Group, and Destinations by Club Meliá. Winners from other industries included Ad Fed trade organization, CSC computer science leader, DAE global exchange company, Everyware mobile application, and True Incentive specialty marketing company. Brand Tango is a comprehensive marketing, design, and technology company with clients in hospitality, real estate, recreation, employment, health care, and financial services. Recent projects include interactive technology and design for Silverleaf Resorts Inc.’s Vacation Store in Buford, Ga., a comprehensive branding campaign for DAE, branded sales environment concepts for International Cruise & Excursions Inc., and mobile solutions for Club Melia, Karisma Resorts and AMResorts. Relying on their decades of combined expertise, its principals and staff help clients find solutions that deliver measurable results. Brand Tango will be attending the ARDA World 2015 Annual Convention & Expo on April 12-16 at the Orlando World Center in Orlando, Florida. To set up a briefing on Brand Tango’s emerging mobile concierge application and services in branding, creative product envisioning, sales center environments, technology for marketing programs and more, contact Joe Russoniello at (954) 295-7879 or joe(at)brand-tango(dot)com.